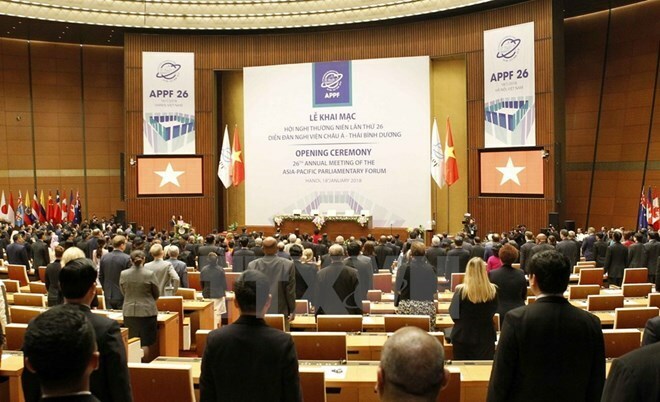 Hanoi (VNA) – The 26th Annual Meeting of the Asia-Pacific Parliamentary Forum (APPF-26) will feature two plenary sessions on politics-security and economics-trade matters on January 19, the second working day of the event. The first session is set to discuss the promotion of parliamentary diplomacy for peace, security and prosperity in the region and the world, along with the fight against international terrorism and trans-border crime. At the second plenary session, APPF delegates are expected to hear the report on the results of the APEC Economic Leaders' Meeting. They will also talk about the role of parliaments in promoting economic links intensively and comprehensively. Other issues to be tabled during the session include food security and sustainable agricultural development, support for micro-, small- and medium-sized enterprises (MSMEs) in the digital age. The delegates will focus on economic cooperation in Asia-Pacific and parliamentarians’ contributions to regional efforts to expand trade and investment cooperation, for peace, stability and sustainable development. The Drafting Committee and working groups of the APPF are also scheduled to convene their meeting on January 19. There will also be bilateral meetings between leaders of the member parliaments on the sidelines of the event. Lasting until January 21, the APPF-26 features four plenary sessions on the topics of politics-security, economics-trade, regional cooperation in Asia-Pacific, and the future of APPF. Founded in Tokyo, Japan in 1993, the APPF now gathers 27 members, namely Australia, Cambodia, Canada, China, Chile, Colombia, Costa Rica, Ecuador, Fiji, Indonesia, Japan, Laos, Malaysia, the Marshall Islands, Mexico, Micronesia, Mongolia, New Zealand, Papua New Guinea, Peru, the Philippines, the Republic of Korea, Russia, Singapore, Thailand, the US, and Vietnam.